When the ink level for an ink cartridge is low, a message appears on the display. You can also check the ink levels by using the printer Toolbox (Windows) or the HP Utility (Mac OS X). Which ink cartridges do I need for my HP Officejet 4500 All-in-One series Printer? For your US, European and UK HP Officejet 4500 All-in-One series Printer you need a HP 901 Black Original Ink Cartridge (CC653AN) and a HP 901 Tri-color Original Ink Cartridge or a HP 901XL CC654 Black High Yield Ink Cartridge. There are also Combo Packs (2 cartridges in one pack) available, like the HP 901XL Black and 901 Color Inkjet Cartridges. 1. Before you replace the cartridges load plain white paper in the input tray. 2. 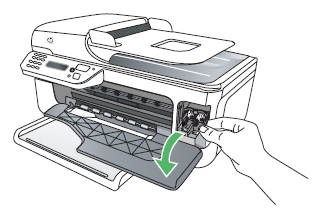 Press the Power button to turn on the printer, if it is not already on. 3. Open the front access door. The print carriage moves to the far right side of the product. Wait until the carriage is idle and silent before you continue. 4. 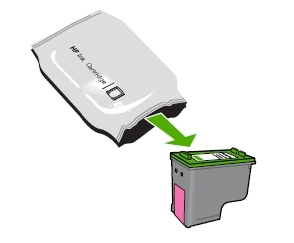 Lightly press down on one of the old cartridges to release it, and then pull the cartridge toward you out of its slot, and then set it aside for recycling. Remove the cartridge from the slot on the left to replace the tri-color cartridge. Remove the cartridge from the slot on the right to replace the black cartridge. 6. Gently remove the plastic tape using the pink pull tab. 7. Slide the cartridge forward into the empty slot. Slide the new ink cartridge at a slight upward angle into the empty slot, and then gently push the ink cartridge until it snaps into place. If you are installing the tri-color ink cartridge, slide it into the left slot. 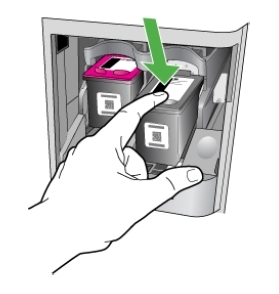 If you are installing a black ink cartridge, slide it into the right slot. 8. Repeat these steps to install the other ink cartridge, if necessary. 9. Close the front access door. 10. Press OK. 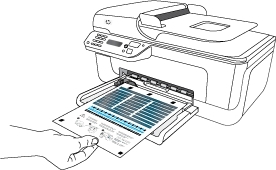 The HP All-in-One prints an ink cartridge alignment sheet. 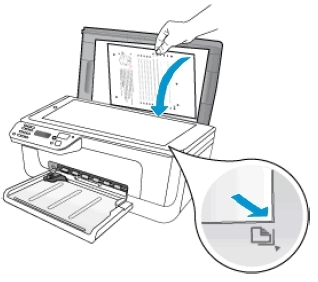 The HP All-in-One prompts you to align cartridges every time you install or replace an ink cartridge. You can also align the ink cartridges at any time from the device control panel or by using the software you installed with the device. Aligning the ink cartridges ensures high-quality output. If you remove and reinstall the same ink cartridge, the device will not prompt you to align the ink cartridges. It remembers the alignment values for that ink cartridge, so you do not need to realign the ink cartridges. 11. Open the scanner lid, and then place the printed alignment page face down on the scanner glass in the front right corner with the top of the page to the right. 12. Close the scanner lid and then press OK. The HP All-in-One aligns the ink cartridges. 13. Recycle or discard the ink cartridge alignment sheet. – Open HP Solution Center: Click Start, click All Programs, click HP, and then click HP Solution Center. – In the Print Settings section, click Printer Toolbox. The printer Toolbox opens in a new window. – Click Print Page. The product prints an alignment page. – Go to step 11.